Coslys Organic Hand Cream with Lavander & Citrus moisturizes, protects and repairs your hands, plus makes your nails stronger ! Rich formula with organic shea butter and aloe vera, your hands regain their softness ! Light texture that penetrates quickly for a pleasantly non-greasy after-feel. Organic lavender oil regenerates your skin whereas organic citrus oil purifies. 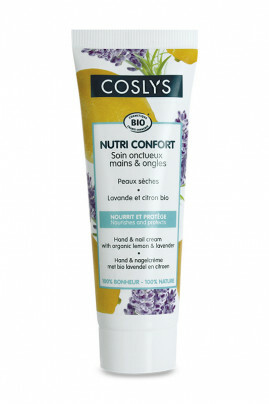 Coslys Lavender & Citrus Hand Cream makes your hands and nails beautiful ! Use Coslys Ultra Nourishing Hand Cream anytime you need ! Apply day and night a nut-size of Coslys Lavander & Citrus Hand Cream on your hands, massage until fully absorbed. Renew the application anytime you feel the need, including after each hand washing. Lavander/Citrus Hand Cream from Coslys makes your hands soft and perfumed ! Aqua, coco caprylate, caprylic/capric triglyceride, cetearyl alcohol , sucrose polystearate, sodium stearoyl glutamate, buttyrospermum parkii butter* , aloe barbadensis leaf juice powder*, cetyl palmitate, citrus limon peel oil*, lavandula angustifolia oil*, sodium citrate, xanthan gum, benzyl alcohol, sodium dehydroacetate, dehydroacetic acid, citric acid, tocopherol, limonene, linalool, geraniol, citral.